'Colours' is the name given to the flags carried by a regiment into battle to indicate the position of the regimental HQ. In battle, the General directing operations could tell, at a distance, where his regiments were. The colours were carried by ensigns, the most junior officers, and guarded by two colour sergeants. In 1747, infantry colours were regulated and in most regiments the First or King's Colour was the Union Flag and the Second, or Regimental Colour was basically the colour of their facings with a small Union Flag in the canton. The Guards regiments kept to the old system and have continued to this day. Their King's Colour is the basic crimson while the Regimental Colour is the Union Flag. But it was always more complicated than that because they had up to 30 Company colours instead of one regimental Colour. On top of this they had three battalions so there had to be a set of Colours for each one. 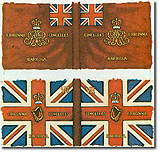 The Regimental Colour was one of the Company Colours which were used in rotation.